Harrisburg, PA – Governor Tom Wolf announced today that his administration secured a three-year grant totaling $422,000 from the U.S. Department of Labor to reduce excessive occupational licensing requirements and explore alternative approaches, such as professional certification, that maintain public health and safety. 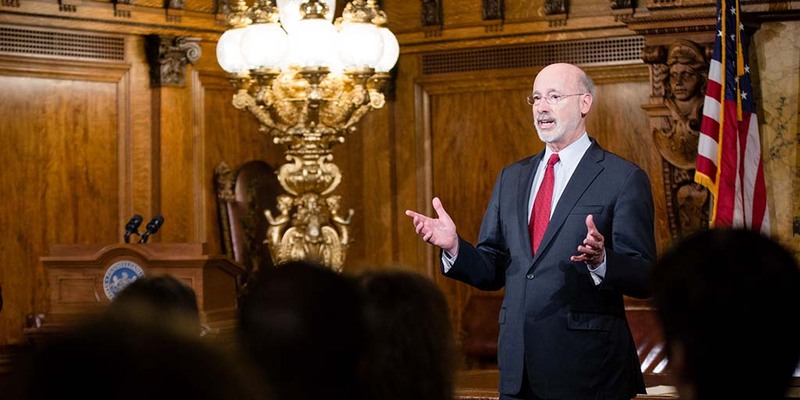 Governor Wolf recently proposed reforms to several job licensing boards and licensing requirements to remove employment barriers for skilled workers. The reforms would eliminate 13 job licenses, including those for barbers, auctioneers and cemetery brokers; ease requirements for relocating military spouses transferring their licenses to Pennsylvania; lower licensing board continuing education requirements to levels established in state law, and repeal the automatic 10-year ban on licensing for anyone convicted of a drug felony. “We will use this grant to explore transitioning from occupational licenses to certifications or registrations where possible, to adopt less burdensome criminal history policies for licensees and to find legislative and policy solutions to workplace barriers for veterans and military spouses,” Acting Secretary of State Robert Torres said. Pennsylvania was one of nine states and two state-government associations to receive State Occupational Licensing Review and Reform grants. In October 2017, Governor Wolf signed an executive order tasking the Commissioner of the Bureau of Professional and Occupational Affairs within the Department of State and the 29 boards and commissions to review the commonwealth’s professional licenses and to benchmark Pennsylvania’s licensing requirements against national and regional averages. Approximately 20 percent of Pennsylvania workers need a license to do their job, with the share of workers with an occupational license much higher than in the 1950s. The Knee Center for the Study of Occupational Regulation at Saint Francis University in Loretto assisted the Department of State in putting together the recently released report (PDF) required by the executive order.